We’ve long been fans of oversized footpegs. The additional control they give your bike, and the increased comfort while standing, make their design a no-brainer for any serious rider. Measuring a massive 2.5-inches wide by 4.5-inches long, our Platform Footpegs provide an extremely stable base from which to control your bike—even over the gnarliest terrains. Their rugged design is cut from aircraft-grade aluminum, and like cat claws on a carpet, precision cut traction cleats provide a grip that’ll hold you on the pegs. They’re extremely lightweight, too, at only 8 oz. each. To make assembly a breeze, an ingenious installation pin is included with each set of footpegs. If you’ve ever fought the return spring while installing footpegs, you’ll know why this tool is worth its weight in GOLD! And just for fun, a handy BOTTLE OPENER is built into each peg for convenient access to your favorite cold beverage after a long day’s ride. These pegs are 2.5-inches wide x 4.5-inches long and weigh 8 oz. each. They greatly improves control of bike—its like adding power steering! Not only is the surface space bigger on these, we have lowered the pegs 1/2-inch giving your knees a much needed break. Standing up is so much less fatiguing with the large platform distributing your weight. We are the only company we know of that provide an special “installation pin” which greatly simplifies installation. We also provide replacement cotter pins – no trips to the hardware store required. 5 minute install time. In addition to its superior appearance, there is a Built-in bottle opener on the bottom of each peg. Handy when popping your favorite beverage at the end of the trail or around the campfire. "The foot print measures 2.5-inches wide x 4.5-inches long which I found to be ample real estate for my size 13 boots and a large improvement over the stock footpegs. Cueing the bike by applying pressure to these beauties really enhanced handling on single track, high speed sand whoops and on extended highway jaunts. The large surface area covered with traction cleats offers a secure feeling while standing, especially in technical sections. Traction was excellent against my smooth sole adventure boots. "While hanging out after a full day of riding, almost everyone commented on how these new units look–nothing like a little understated bling on an adventure bike. The built in bottle opener located on the bottom side of the footpegs made for a nice conversation piece and came in handy for few riders opening their favorite bottled beverages before discussing the day’s ride. 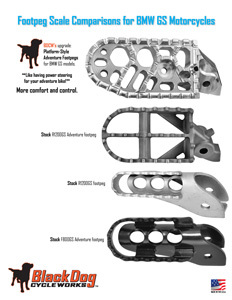 "If you have a KTM adventure bike and can’t quite get comfortable on the machine because the stock footpegs are too small then consider the Black Dog Cycle Works offering."